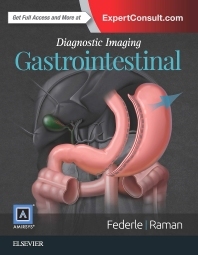 Ideal for trainees and practicing radiologists, Diagnostic Imaging: Gastrointestinal, 3rd Edition provides comprehensive coverage of every important topic in abdominal and gastrointestinal imaging. Featuring an increased number of illustrations, graphics, and multimodality imaging, this updated medical reference book will aid you in recognizing the characteristic and variant appearances of both common and uncommon abdominal disorders. User-friendly bulleted text and a uniform chapter layout allow fast and effortless access to the crucial knowledge you need! Expanded coverage of the most important topics and trends in fluoroscopic evaluation of the GI tract, including evaluation of patients before and after bariatric surgery, fundoplication, and surgery for esophageal carcinoma. Updated sections covering disorders of the liver, biliary tract, and pancreas with information and images regarding new classification and treatment implications for pancreatitis, including autoimmune (IgG4-related) pancreatitis. Increased number of illustrations of all appropriate imaging modalities, such as multiplanar CT, sonography, MR, and PET/CT. Offers information on all forms of acute and chronic hepatitis and cirrhosis, as well as critical knowledge regarding imaging techniques that allow radiologists to distinguish among focal lesions in the cirrhotic liver.